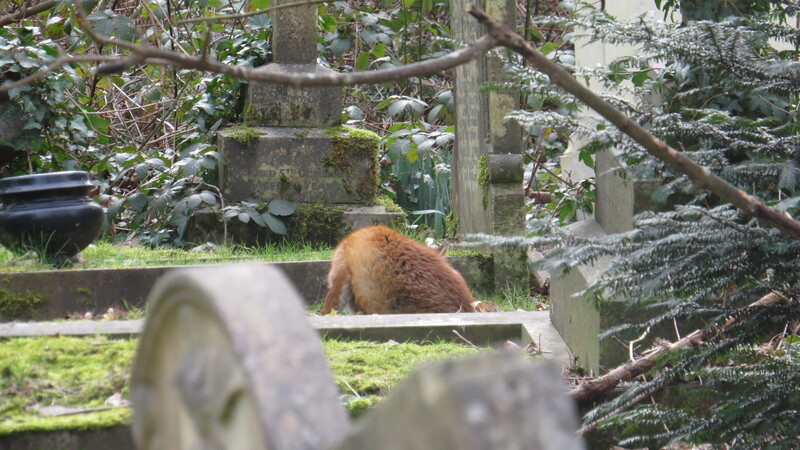 Dear Readers, when I was in St Pancras and Islington Cemetery last week, I noticed a fox resting on a mossy mound in the late winter sunshine. 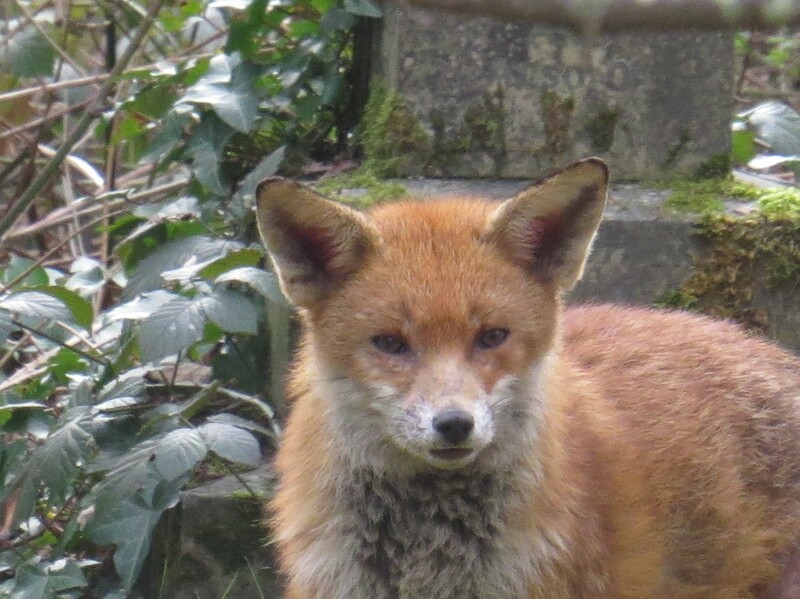 The foxes here are truly wild creatures, apt to melt away into the undergrowth as soon as they see a human, so I was surprised to see this one in daylight. 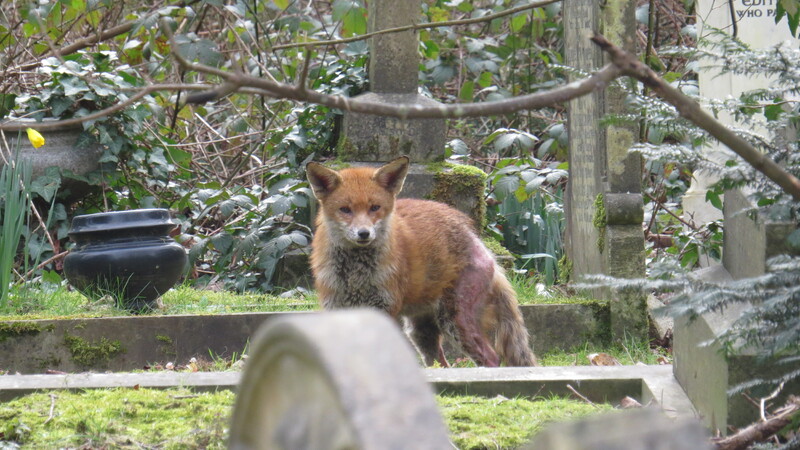 I am always delighted by the appearance of a fox, whether he is trotting up the street after opening all the food-waste bins ( a recently acquired skill) or here in the cemetery. But it wasn’t until I got home and looked closely at my photographs that I realised that this particular fox has a problem. 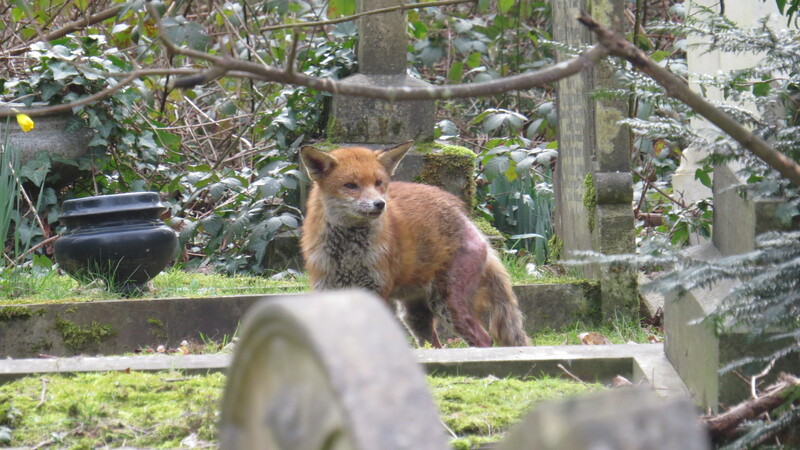 A quick glance at the fox’s rear-end shows that he has a horrible case of sarcoptic mange. This is not unusual in town foxes, and some veterinarians believe that it might be so prevalent because of the stress and poor nutrition that urban animals are prone to. Believe it or not, according to the fox charities that I contacted (details below) this is a relatively mild case. Left untreated, however, it is likely to get worse. Sarcoptic mange (also known as scabies) is caused by a microscopic mite, which burrows into the skin, causing hair-loss and irritation. The biting and scratching at the affected area can give rise to skin infection and also encourages the mites to spread, which can ultimately be fatal. Foxes can tear themselves apart trying to deal with the intense itching, to the extent that they no longer eat or drink. This is an infernal parasite, and one which is all too common. 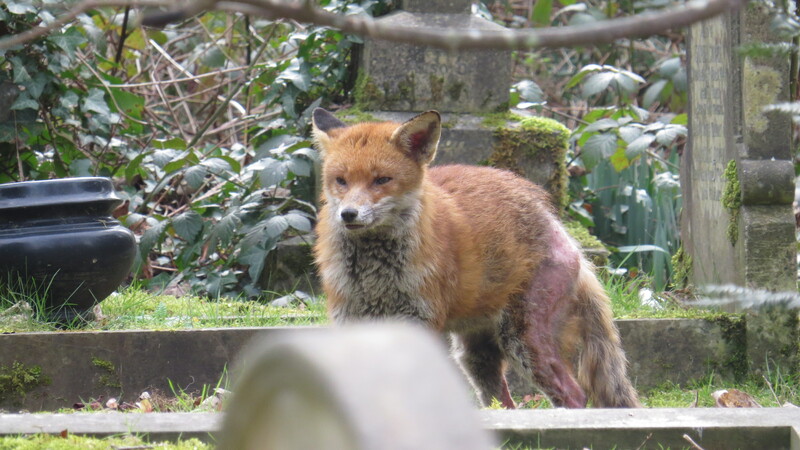 If this was a fox that visited my garden, it might be worth working with one of the fox charities to see if it could be trapped and treated with the pharmaceuticals that are normally used – Stronghold to kill the mites, and a wide-spectrum antibiotic to sort out the infection. But there is no way that anyone will set a trap on public land, when anything from the wrong fox to a cat to somebody’s pet dog could be caught. Nor could the drugs just be left around for the fox to find, as they are dangerous to nursing and pregnant animals, and can even be poisonous. Which brings me to homeopathy. I will admit to being a homeopathy skeptic. I believe in the efficacy of herbal treatments, acupuncture, and many other ‘alternative’ therapies, but I find it difficult to believe that a solution so dilute that the active ingredient may be only a few molecules can be helpful. 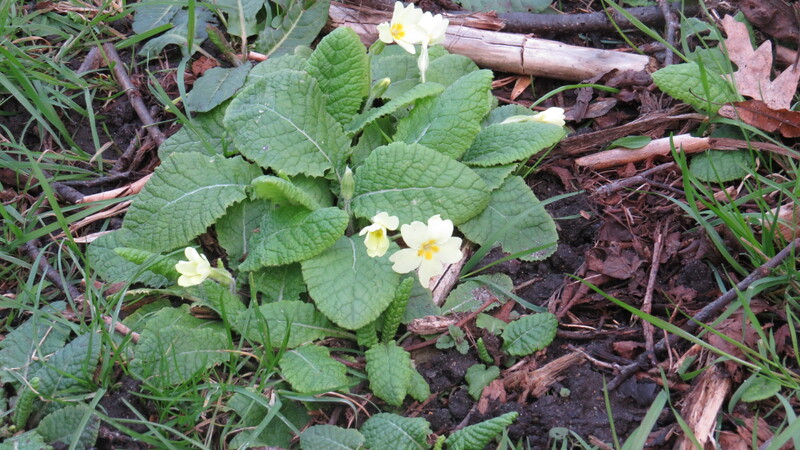 But be that as it may, I know that, used with foxes, a homeopathic remedy ( Arsenicum album and sulphur 30c) has proved to be extremely efficacious in treating mange. It isn’t clear why, but there is a theory that it supports the immune system of the fox, enabling the animal to resist the worst effects of the infection. It is completely harmless to other animals, and can be used without concern even amongst pregnant or lactating animals. 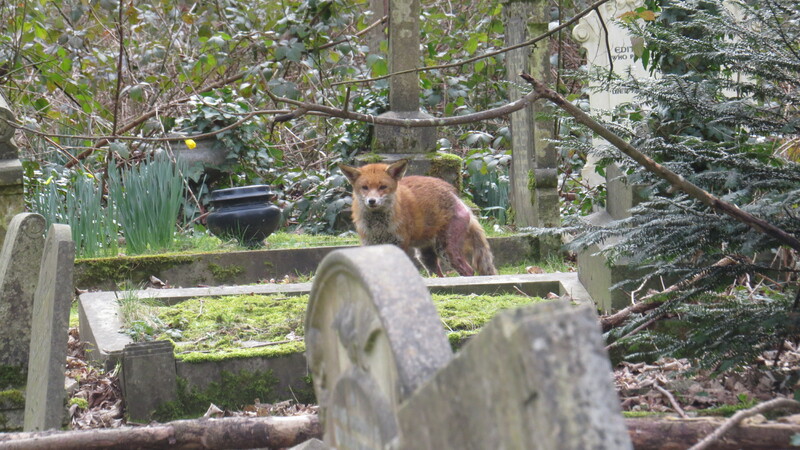 And so, for the past few days, I have been trudging down to the cemetery and depositing a jam sandwich, cut into 15 tiny pieces and containing exactly four drops of the homeopathic remedy, on the mossy knoll where I last saw the fox. And some days, it’s been a bit of a wild and windy walk, with a huge hail storm on Wednesday, and a relentless drizzle on Thursday. But there are compensations. When faced by all the human and animal tragedy in the world, I feel overwhelmed. I have no idea where to start. There is misery at home and abroad, and everything cries out for help. In the midst of all this, I feel helpless, useless. But this is one tiny thing that I can do. Will it work? Who can say. I do know that every last scrap of the sandwich is eaten, though whether by ‘my’ fox or some other creature I don’t know. I feel that there is something worthwhile just in the act of witnessing, of noticing that a fellow creature is suffering, of trying to help. Compassion is a muscle that has to be exercised, and I know, for myself, how easy it is for it to atrophy. I often feel so loaded down with my own worries that I’m reluctant to take on even the smallest element of somebody else’s troubles. 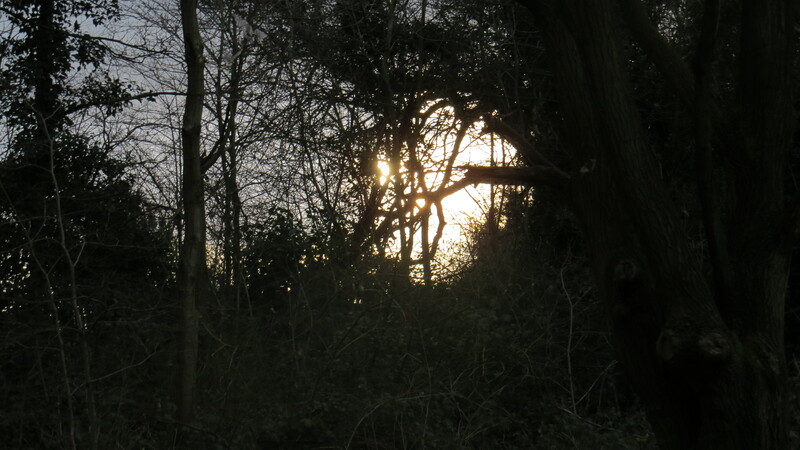 And yet, when I’ve finished this piece, I’ll put on my trainers and stride out, through the mud in Coldfall Wood and onwards, a jam sandwich in my pocket, knowing full well that I’m probably on a fool’s errand, but heading off just the same. This fox has crept in under my defences and looks at me with his amber eyes, challenging me not to look away. The Fox Project is based in Kent, and works in southern England, but will give advice if you contact them wherever you are based. 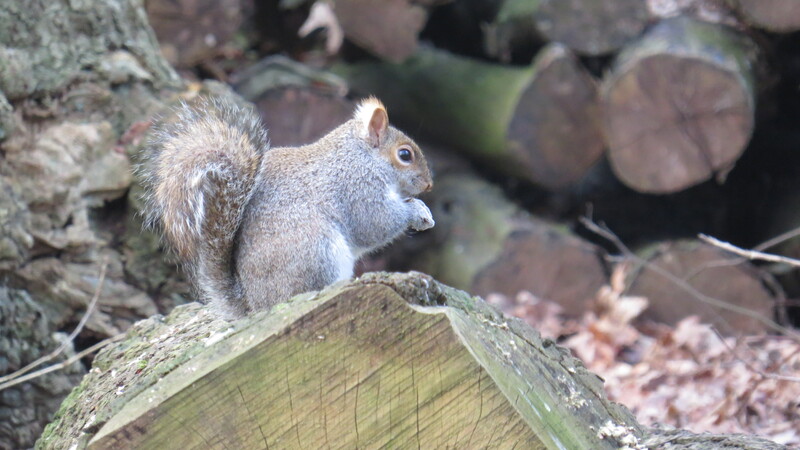 This entry was posted in London Mammals on March 5, 2016 by Bug Woman. This was such a wonderful post on so many levels. It made me really ponder where we humans would possibly be without our deep sense of compassion, which, even in the smallest of doses, compels us to try to change the course of suffering, wherever it occurs. Given the daunting obstacles that sadly seem to prevent treating this fox with powerful drugs, you didn’t just turn your back, but “thought outside the box” by leaving the remedy-laced jam sandwiches to help soothe its terrible ordeal. I hope we’ll be able to read some future updates with good news for the little fox. Yes! We must always try to access our compassionate nature no matter what. I feel that in the end it is what everything is about. Give my best to your friend the little red fox and thank you for lightening my day. Thank you, Marla! And I agree, it’s what it’s all about. I’ll pass on your good wishes to the fox. I have a strange feeling that it helps. Deeply impressed by your actions, even the smallest act of kindness helps. Win or lose you did your best. Thank you. If I were there I would help you trap him, in a kennel, or set up a trap somehow, because scabies can be successfully treated sometimes with just one or two chemical dips. That’s how well they work. It’s a matter of somehow trapping the animal and pouring the solution on him. I’ve healed street dog’s with the same conditions. The dip starts working right away. We’d make a good team I think, Maria! But the homeopathic stuff does have a remarkable record of success where the mange covers less than 40% of the animal, as here. I am as surprised about this as anyone is. I didn’t know that. All I know is that the chemical dip is so powerful that if the dog or fox get soaked with it, it kills it in an instant. I know trapping a fox is a project, but there are wildlife rehabilitators who also use traps to capture injured animals. In the U.S., however, you have to have a license to trap and rehabilitate a wild animal. I’ve rehabilitated stray dogs and pigeons because no one else will. I’ve seen this in foxes too. Very sad, and they have such a truly forlorn expression when they have this awful blight. I try to help people and creatures alike, but get so tired of the scorn poured onto any gesture made towards animals, which is interpreted as disinterest towards humans and therefore somehow to human detriment. Each living being has its place on earth, even if we don’t always get our minds around what their role might be. Barring natural disasters, a large part of the suffering that humans endure has been triggered by some form of human activity/act/attitude. Virtually all animal suffering has been caused by these and continues to do so because these victims are ‘just’ animals. Uncivilized behaviour, cruel traits and wicked deeds are always bundled together as some person ‘acting like a complete animal’, but I don’t see too many animals functioning like this. It would simply be against nature – the survival of the species. I really hope that the treatment works on your fox. Even if it doesn’t end up reaching him/her, perhaps it will build up the defenses in other creatures, along with a healthy appetite for jam sandwiches! Hi Beach-Combing Magpie, I agree wholeheartedly with your sentiments. In my experience, compassion is not exclusive, and in fact grows the more it’s exercised – just because the subject of my concern today is a fox doesn’t mean that I don’t care about children, or refugees, or the homeless, in fact quite the opposite. And you’re right, animals are not wantonly sadistic, and do not plan acts for the mere purpose of making another animal’s life a misery, as humans do. And yes, even if it isn’t my fox who is eating the jam sandwiches, someone is having a late evening treat! A reminder to each of us to exercise that compassion muscle at any opportunity that presents itself. Wonderful post. Ah welcome Dianne, and thank you! What a kind and compassionate person you are and I do so hope that your intervention helps rid this poor creature of his mange. Lets hope that the remedy does the trick. Do please keep us posted as to his condition.